I enjoyed getting this update from my dad about meeting a local UPS bike messenger. 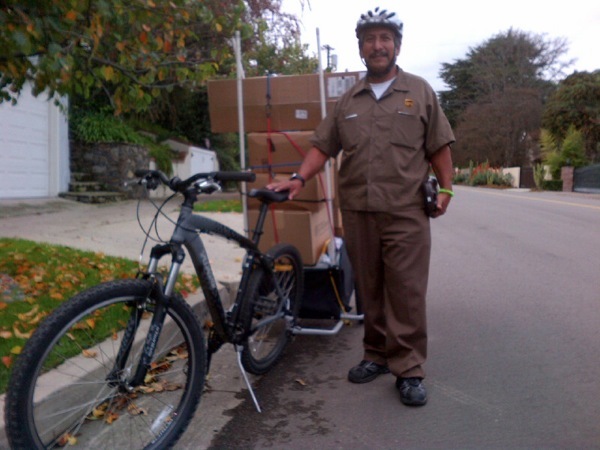 During the holiday season, UPS puts some of their drivers on bikes to reduce fuel costs and increase capacity while they’re delivering more packages than during the rest of the year. Here’s the description my dad sent me in an email this week, and a photo he took of the messenger. Who knew? UPS has a mini fleet of bicycle delivery guys. This is Umberto, who works Valley Vista Blvd & environs. He loads up from a truck trailer parked on Van Nuys Blvd, and makes several round trips (!) a day. Says he has counterparts “all over LA”. They work from before Thanksgiving to Christmas. He’s riding a stock ‘hybrid’, off-road frame with 21 gears and tires wider than street but thinner than stump jumpers. I’ve seen him climbing the local foothills in low gears for weeks. His trailer is an amalgam of a stock lower section augmented by PVC and bungees – a design “by my manager,” he says, though “we suggested the bungees to hold the load together better.” I had more to ask him, but he was obviously on the clock.